Hello! 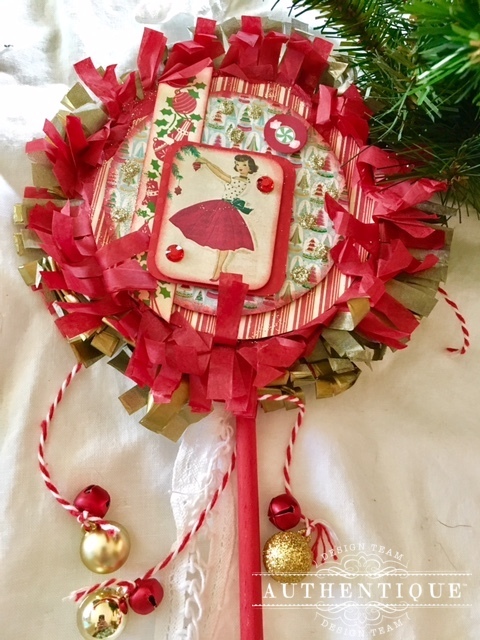 Summer is here, and while it's wonderfully sunny and warm in most places, we want to bring a little cool breeze of Christmas your way. It's Christmas in July week! All of us at Authentique have grouped up together to share with you some new projects using our Jingle Collection. At the end of the week, we have a little surprise peek at some new collections! Hello everyone! Daniela here to share with you on the blog my projects with Jingle, the BRAND new Christmas line by Authentique Paper! This paper line is so bright and cheery, so I wanted to do something FUN! I made these great Picks and Ornaments. These first 3 I'm sharing are Picks. I plan on using them in some of my floral arrangements around the house. You can really put these anywhere in your house. I've used papers and the new Jingle "Elements" to make these 4" round "Picks". I've also added ribbon with jingle bells on the end for fun and movement. Another use for these wonderful 4" Decorated circles is add a hang ribbon from the top and you have Handmade Ornaments! What a beautiful gift to give a loved one. These 4" circles are really versatile. You can use them as Gift Toppers, you could string them all together and make them a banner. Really your imagination is the limit! 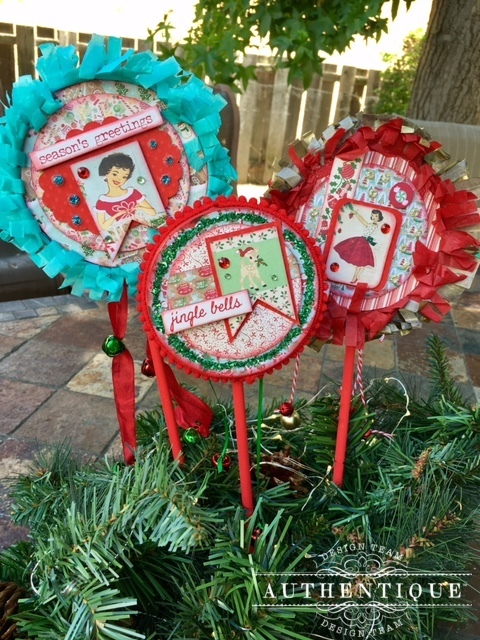 Have a fun little party with your friends, along with plenty of JINGLE Paper packs and you'll be making lots of fun handmade items. Hello there friends and crafty peeps! 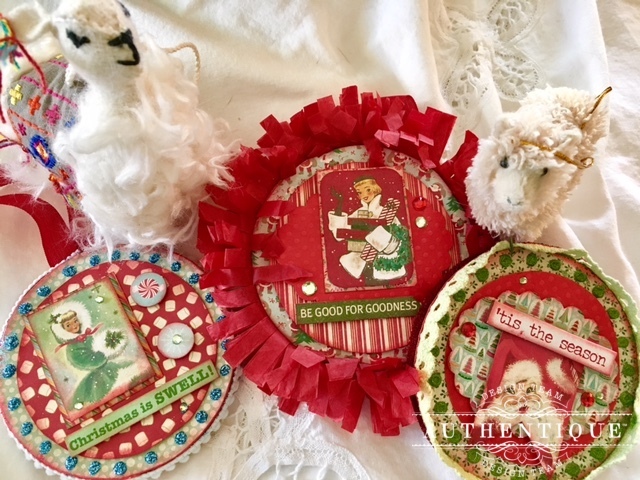 It's my day to share the project I created to participate with the Authentique Team Christmas in July series. 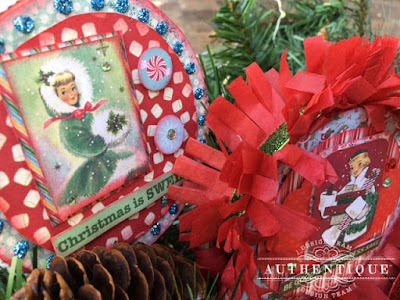 I've been celebrating that all month on my blog so I was eager and ready to jump in with this mini scrapbook album I created with the new Jingle collection. I can't help but to love this collection. 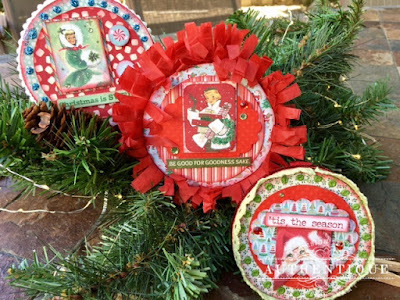 It's retro and vintagy and has amazing patterns and fun holiday images! And it layers like a dream! I've used green cardstock matting throughout the book for a consistent look and to keep the pattern mash ups from looking too busy. The page on the left has a large banner shaped tip in that folds in from the top. It's decked out with a die cut doily, embossed stars, flowers, and holly. The right side has a lovely photo mat that's raised and bordered with a pretty die cut frame. The last set of pages have a large Santa image with lined pattern behind just perfect for writing in all those special memories. Pretty glitter chipboard stickers spell out a festive holiday sentiment and add a bit of sparkle. 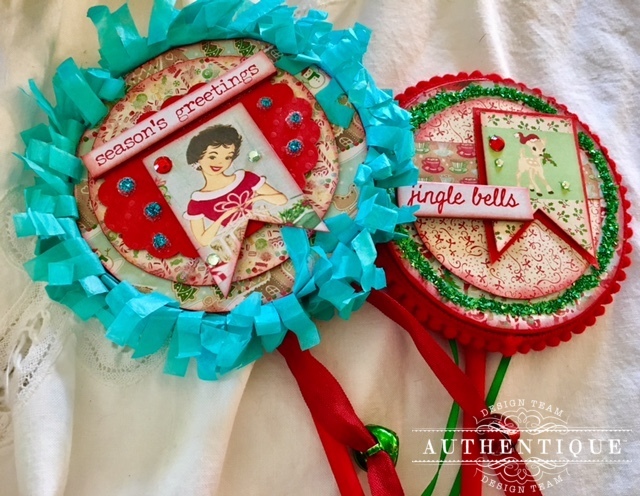 Tiny handmade flowers with holly and a loopy bow of baker's twine is a swet and simple way to finish off this layout. ~Additional Supplies~ Cardstock, Ribbon, Flowers, Twine, Sequins, Bells, Metal Charms, Acrylic Charms, Altered Chipboard. Sending love to Daniela! Those picks are so cute! Something different to try! Beautiful mini album and adorable Picks!! Love this paper line, I have a few old Authentique Christmas paper collections in my hoard vault!